Have you ever looked around your neighbourhood and not known where to start? You see dysfunction, but can’t figure out the cause; you see pain, but can’t figure out the cure. The city runs an anti-litter campaign but it fails; a gym around the corner offers a summer kids' camp that’s poorly attended; a local church hosts a neighbourhood outreach potluck to which only church members come. You scratch your head and wonder why, after so many efforts, your neighbourhood hasn’t changed. Perhaps it's because successful community development has to start with the community. “Insiders” are often too close to their challenges to find a way out alone, but “Outsiders” cannot identify the true needs of a group with which it has no relationship. In light of this reality, a key part of FH’s work is helping communities identify their own development priorities so they can create their own preferred strategies for transformation. An excellent case study for the success of this process is the community of Cachiman, Haiti. Take a look at three areas of progress they’ve made and how they got there. It was easy for everyone in Cachiman to see that they were suffering from post-harvest crop losses; 80 per cent of farms in Haiti are unable to produce enough food for even the farmer’s household. Organized discussions between local farmers and FH Staff revealed that depleted soil, poor quality seeds, and lack of education in efficient farming techniques were significantly contributing to the presenting problem. After cooperatively identifying the issue, Cachiman residents and FH Staff worked together to create a strategy to tackle the problem. They decided they needed to promote innovative and environmentally friendly farming techniques; doing the same thing over and over again just wasn’t working. Farmers also asserted that they needed access to quality seeds and livestock to improve crop yields and diversify farming activities. Since beginning this cooperative troubleshooting process, 50 households have been trained in Keyhole gardening techniques and 40 of them have established their own Keyhole gardens. These compact, compost-rich and drought-resistant gardens can be made entirely with local recycled materials—sometimes even entirely for free! 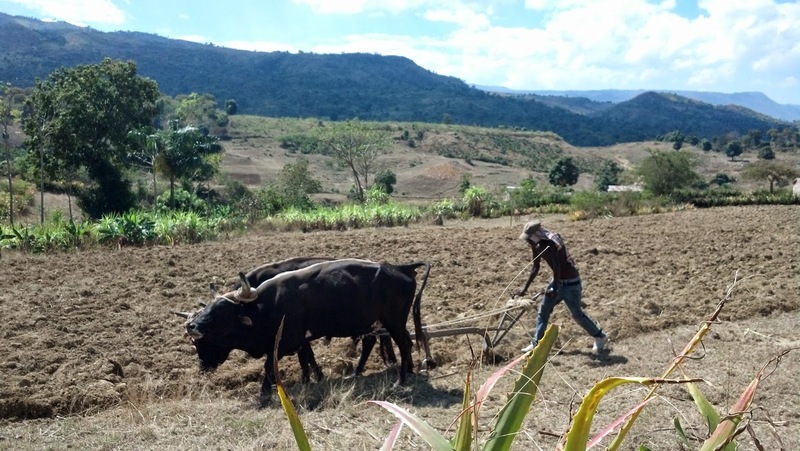 A group of farmers have also been trained on leek and cassava harvesting techniques, and members of this initial group are now teaching others using their own farms as “demonstration plots”. With livestock, the first group of farming families have received rabbits and goats. As payment, each family agreed to give their animal’s first offspring to another family in need, and so far the “repayment” rate is at 100 per cent! Groundwater pollution, crop contamination, and the spread of serious diseases are all observable threats to communal health due to a lack of sanitation. Why did Cachiman lack sanitation? Were they just dirty people? No! About three-quarters of households in Cachiman are without sanitary latrines (i.e. toilets). That’s not just an inconvenience - it’s a life-threatening situation! Interestingly, instead of rushing to the plumbing, Cachiman decided to invest in community mobilization and education instead. Similar to North American campaigns on drunk driving or smoking, the message is that an individual’s actions can threaten the health and safety of everyone else. It matters where you dump your “waste” bucket. The community is rallying for collective change! They’re discussing how to introduce widespread sanitation measures in locally appropriate and innovative ways. Representatives from 50 per cent of households have attended formal trainings (when was the last time half your neighbourhood showed up to a public meeting?). In response to these collective efforts, about 20 households have already dug pits in preparation for latrine construction. Farmers were struggling to open larger farms or invest in necessary tools and seeds primarily due to limited access to formal banking and microfinance services. The people of Cachiman determined to establish a network of Savings and Loans Groups with the help of FH training. These groups will continue to grow and multiply long after FH is gone. Thus far, five groups of 25 members each are in training to self-manage their accounts and to fill the different roles required in microfinance operations. Group members are saving money in a safe and secure way and accessing small loans from their collective savings. They all benefit as the interest gets paid back to the group, which helps grow their capital without any financing from outside lenders! If you were to combine the “issues” from these three areas without seeing the strategies and outcomes, you would probably be overwhelmed. But when a group of individuals, the “Insiders”, comes together as a community, and partners with the fresh perspective of a group of “Outsiders”, it’s much easier to identify the root issues beneath the presenting problems, develop appropriate strategies, and enjoy sustainable outcomes. So what do you think? Can you apply this process to your neighbourhood? To access tools that will help you and your community apply these principles, visit FH Canada.